Christmas just passed and it is time to start with Chinese New Year cookies. I made these thin crunchy Biscotti last week. This is really an Italian cookie that we Asian Chinese have adopted as one of the many goodies enjoyed during Chinese New Year. 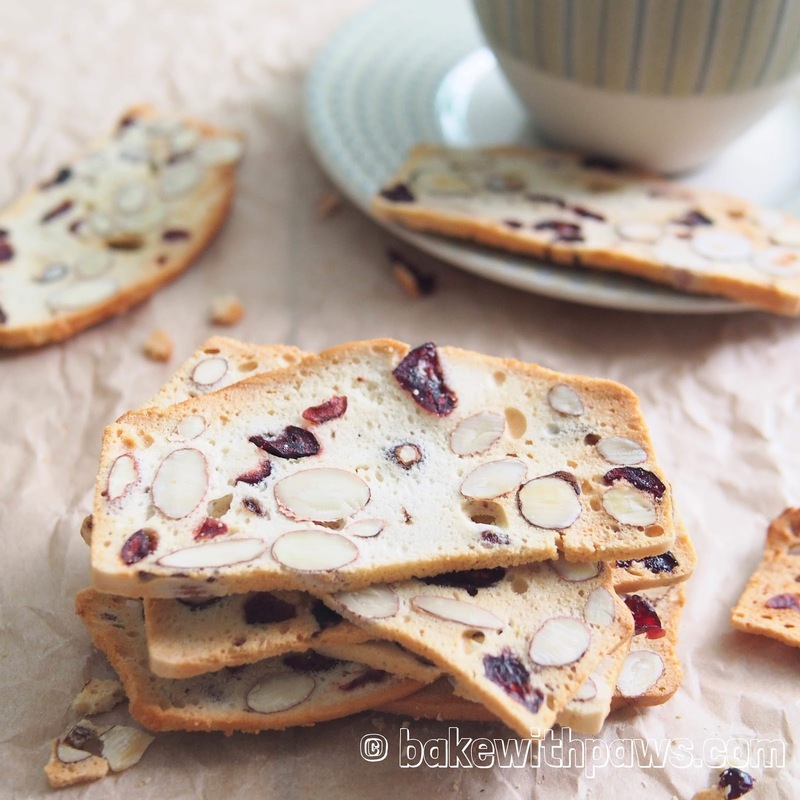 Of course, it is still Biscotti and they are always good at any time and season with a coffee! Preheat oven to 180C. Line the baking pan with parchment paper. Sift flour and baking powder together in a bowl, add in salt. Set aside. Whisk egg whites until foamy with electric mixer. Gradually add in sugar and whisk until stiff peaks. Fold in the flour mixture with a spatula gently. Then add in nuts and cranberries. Gently mix until well mixed. Pour the batter into the prepared loaf pan and bake at preheated oven for 30 minutes or until light brown. Remove from oven and let it cool in the pan for 5 - 10 minutes before removing the paper and let it cool on wire rack. Once completely cool, wrap with cling film and keep in the fridge overnight or at least 5 to 6 hours before slicing. Preheat oven to 150C and line the baking trays with non-stick baking paper. Remove loaf from fridge and cut into thin slices (about 2 mm or 0.2 cm thick). It is better to use the bread knife to get a straight and even cut. Place the biscotti on the prepared baking trays and bake again at preheated oven for 10 – 15 minutes or until crisp, dried and light brown. Remove from oven and leave to cool completely on a wire rack before storing in an airtight container. I absolutely agree! 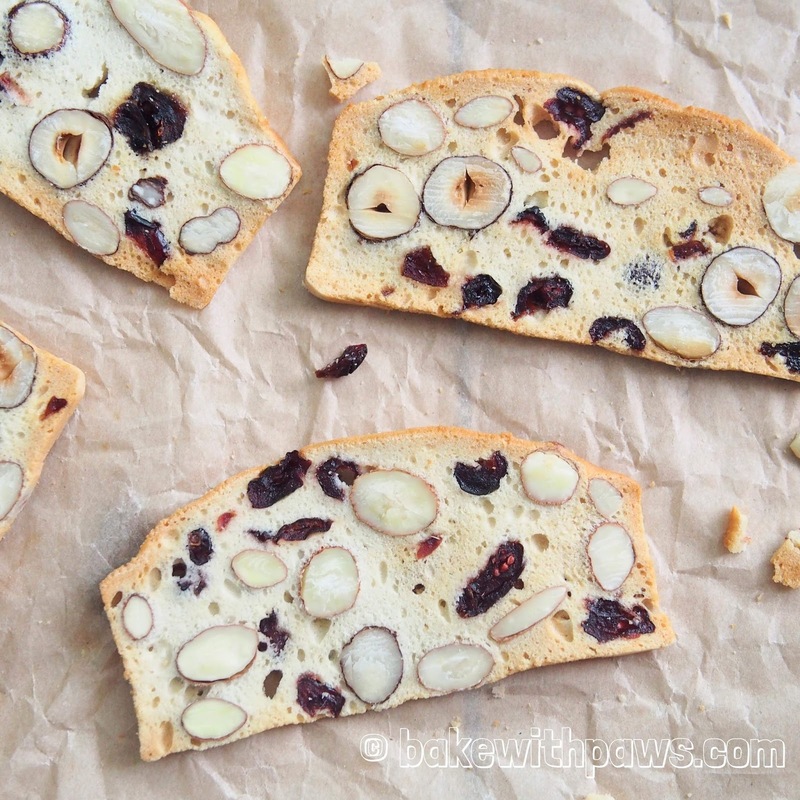 Biscotti are great any time of the year! I make a similar cranberry almond biscottti... so very addictive! Happy New Year!! !